"This is one of the first examples of a peptide that acts like the main protein in good cholesterol and can be delivered by simply eating the plant," said senior author Dr. Alan M. Fogelman, executive chair of the department of medicine and director of the atherosclerosis research unit at the David Geffen School of Medicine at UCLA. "There was no need to isolate or purify the peptide — it was fully active after the plant was eaten." The researchers found that mice that ate the peptide-enhanced tomatoes, which accounted for 2.2 percent of their Western-style, high-fat diet, had significantly lower levels of inflammation; higher paraoxonase activity, an antioxidant enzyme associated with good cholesterol; higher levels of good cholesterol; decreased lysophosphatidic acid, a tumor-promoter that accelerates plaque build-up in the arteries in animal models; and less atherosclerotic plaque. Previous studies performed by Fogelman's lab and other researchers around the world in animal models of disease have suggested that a large number of conditions with an inflammatory component — not just atherosclerosis — might benefit from treatment with an apoA-1 mimetic peptide, including Alzheimer's disease, ovarian and colon cancer, diabetes, asthma, and other disorders. The peptide would be considered a drug if given by injection or in a purified pill form, but when it is a part of the fruit of a plant, it may be no different from a safety standpoint than the food in which it is contained — and it may be better tolerated than a drug, Fogelman said. He noted that one possibility could be the development of the peptide into a nutritional supplement. The team chose a fruit — the tomato — that could be eaten without requiring cooking that might break down the peptide. 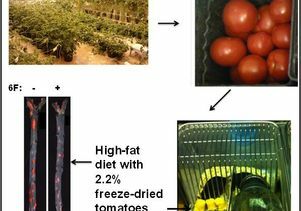 The researchers were able to successfully genetically express the peptide in tomato plants, and the ripened fruit was then freeze-dried and ground into powder for use in the study. All of the intellectual property is owned by the UC Regents and managed by the UCLA Office of Intellectual Property and Industry Sponsored Research. The technology is currently licensed exclusively to Bruin Pharma Inc. Authors Alan M. Fogelman, Mohamad Navab and Srinivasa T. Reddy are pincipals in Bruin Pharma. Fogelman is an officer in the start-up company. Other disclosures are available in the manuscript. Other authors included Arnab Chattopadhyay, Mohamed Navab, Greg Hough, David Meriwether, Victor Grijalva, James R. Springstead, Ryan Namiri-Kalantari, Brian J. Van Lenten and Alan C. Wagner of the department of medicine at the David Geffen School of Medicine at UCLA; Robin Farias-Eisener, Feng Gao and Feng Su of the department of obstetrics and gynecology at the Geffen School of Medicine; and Mayakonda N. Palgnachari and G.M. Anantharamaiah of department of medicine at the University of Alabama, Birmingham.